NATICK, MA, October 22, 2015 — WBUR is among the most high-profile NPR affiliates nationwide. As the production station of programs like Car Talk, On Point, Only A Game and Here & Now, the Boston station’s programs and journalists have won hundreds of awards for reporting, features and news series, documentaries, investigative reports and digital innovation, including numerous National Edward R. Murrow Awards. The station has always sought to achieve excellent audio, and it recently acquired a pair of 8351A SAM™ Smart Active Monitors from Genelec, the leader in active monitoring technology for over 35 years. 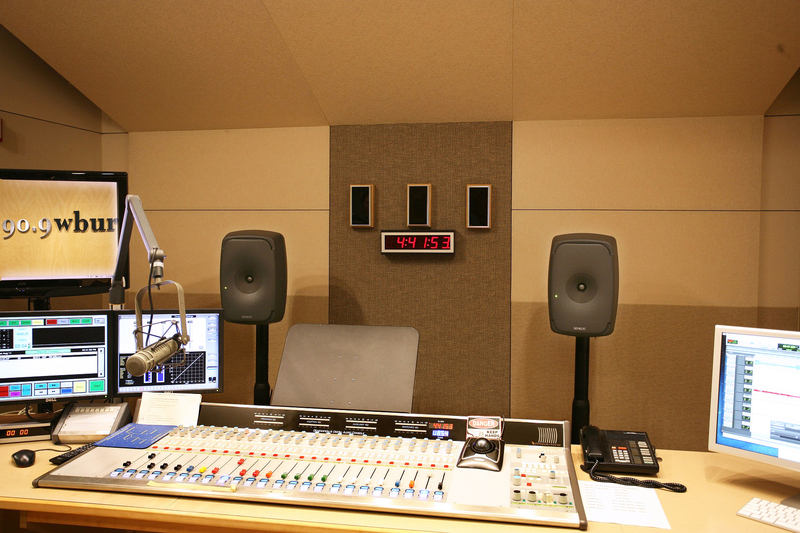 Installed in the station’s Studio 3, the 8351A’s immediately proved their worth for a broad mixture of talk and music programs, and they joined the Genelec 1031A monitors in WBUR’s three other studios, continuing the station’s status as a heavily-Genelec facility. “What we have now is a full-range, three-way speaker in the same amount of space as a typical near-field monitor,” says Michael LeClair, Chief Engineer for WBUR, responsible for all the technical aspects of radio transmission and audio production facilities. “In a radio studio, you don’t have a ton of space, but now with the 8351A, we can hear the way you would in a larger studio with bigger monitors. We’re hearing low frequencies like we’ve never heard them before. Certainly for music, but even in the voices of the announcers.” That, says LeClair, who was voted “Public Radio Engineer of the Year” in 2012 by the Association of Public Radio Engineers, is a game-changer. “It had been hard to tell exactly what the real low end was like on typical near-field monitors, so you tended to pull back on it a bit. But the first time we turned the 8351A’s on, the image was exact, immediately. It gives you the confidence you want in a mix.” LeClair explains that he’s avoided using subwoofers, because they can lead to phase problems. Now, with the full-spectrum three-way 8351A, the entire range of audio is present and always fully phase-coherent. Photo caption: One of the control consoles at WBUR in Boston, featuring Genelec 8351A SAM™ Smart Active Monitors.